The annual Chonburi Buffalo Races will take place from Oct. 18-20 on the field in front of the Chonburi City and provincial government offices. As usual, races will be complemented with booths selling locally made items, stage performances and games. There will also be a “13 kwienkan” cart for offerings to monks, parade and an amulet-judging contest. Events also include a buffalo beauty pageant, Miss Farmer beauty contest and a comic buffalo costume contest, rides for children and concerts of folk music. TFI’s second charity event will be a Disco music night held at the A-One Royal Cruise Hotel, Pattaya Beach Rd. (between soi 2 & 3) on Saturday, Oct. 19 from 7:00 p.m. until late. There will be a free flow of drinks from 7 p.m. – 10 p.m. or as long as stocks last. Admission price is 400 baht for an advance purchase ticket or 500 baht at the door. Tickets can be obtained at www.facebook.com/funcharityevents or www.tfi-events.com. Proceeds from the event will go to the Heartt 2000 HIV-AIDS charity. Horseshoe Point in east Pattaya will be the venue for a family fun day and 20/20 Ashes cricket match on Saturday, Oct. 26 from 11 a.m. – 8 p.m. The event will feature a children’s fun fair and entertainment, food and beverage stalls and a major raffle with a Honda motorcycle as first prize. Entrance for children is free and adults are asked to leave a small donation as all the proceeds from the day will be handed over to charity. For more information, contact Paul on 089 096 2491 or go to website: www.1halo.info. Oktoberfest at Amari Orchid Pattaya: Experience Germany’s greatest tradition! 1,400 baht net per person including buffet with German specialties, seafood, and one beer mug plus one 50 cl. Oktoberfest bier. Live entertainment will be provided by Die Bayrische. Dinner served under a marquee on October 25-26, starts at 7 p.m. Book now at [email protected] or tel. 038 418-418. Rayong-Pattaya Ladies Circle in co-operation with Women With A Mission will hold a Red Carpet Charity Dinner Dance on Saturday, November 2 at the Hard Rock Hotel Pattaya from 7 p.m. – midnight. Entertainment for the evening will include an art exhibition, fashion & dance shows, photo shoots, and much more. A champagne reception will be followed by a buffet dinner including free-flow beer, wine and soft drinks. Tickets cost THB 2,200 and can be obtained by contacting Michelle on 082 179 1037, Kylie on 087 482 3520 or the Hard Rock Hotel Pattaya Box Office at 038 428 755. Delicious Indian cuisine at the Golden Chimney. Golden Chimney, Pattaya’s newest fine dining Indian restaurant located on Pattaya Tai (South Rd.) 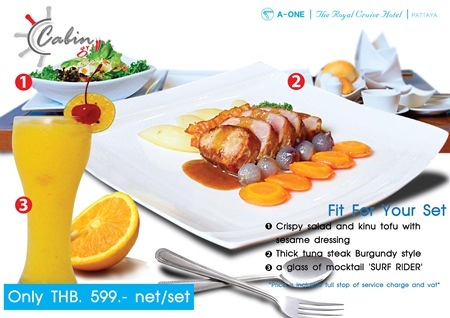 between CAT telecom and the Shell gas station offers a special set menu for only 299 THB net. 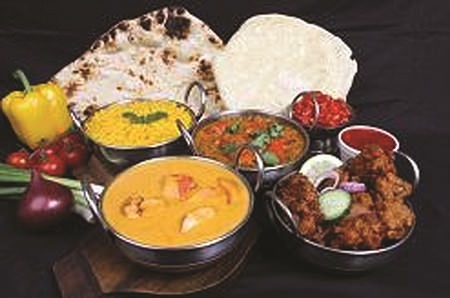 This includes Appetizer: popadums, chutneys & pickles; Starters: onion bhaji & chicken tikka; Main meals: chicken madras curry & vegetable curry; Sundries: 1 Pulao Rice & 1 naan bread; Dessert: 1 Kulfi or 1 Gulab Jamun. Call now for reservations at Tel. 038 414 675. 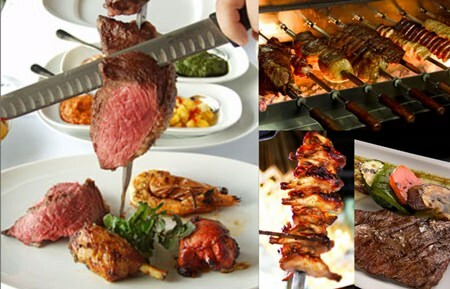 Zico’s Pattaya restaurant of Centara Grand Mirage Beach Resort is Pattaya’s only Brazilian Churrascaria restaurant. Enjoy succulent meat and fresh seafood; as much as you can eat on long skewers which gracefully pass through the tables. Special on every Wednesday and Thursday enjoy free flow beef unlimited 2 hours with 15 skewers at only Baht 999+ per person (subject to 7% VAT). And don’t miss the great selection at the salad bar. Brazilian Samba Queens perform at 8:00 p.m. and 9:00 p.m. with an amazing dance routine and hot music (except on Mondays). For more information or table reservations, contact 038 043 516 or email: zicospattaya @chr.co.th. ‘Fit for your set’ menu at Cabin Grill Restaurant. Throughout the month of October, Cabin Grill Restaurant offers diners a special ‘fit for your set’ selected menu of crispy salad and kinu tofu with sesame dressing, thick tuna steak burgundy style and a glass of mocktail ‘Surf Rider’. Price is only 599 baht net per person. 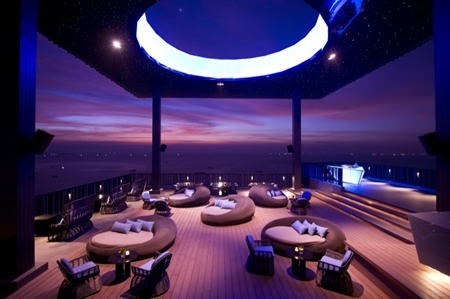 Chill out and enjoy your meal with a stunning 180 degree view of Pattaya Beach. Cabin Grill is located on the 2nd floor of the Royal Wing in the A-One Royal Cruise Hotel between Soi 2 and Soi 3 on Pattaya Beach Road. Open daily from 11.00 a.m. – 10.00 p.m. For more information call 038 259 555, ext. 4232. The Bay Italian restaurant offers a relaxed dining experience in a contemporary setting with both indoor and outdoor seating and a scenic view of Pattaya Bay. The Bay is located at the Dusit Thani Pattaya Resort, next to the Dolphin Roundabout in North Pattaya. Opening hours are Monday to Sunday – 11:00 a.m. to 10:00 p.m. For more information and reservations, please call 038 425 611-7 ext. 2270. The open kitchen concept at Edge restaurant, Hilton Hotel Pattaya, creates an interactive dining experience combined with natural light and breathtaking views. Monday’s “Post weekend BBQ” features freshly grilled sausages, Korean style pork cuts and chorizo burritos while Tuesday’s “Mediterranean Fare” includes Middle Eastern dips and salads, pizza and pasta. On Wednesday, Edge presents “Burgers, Salads and Gourmet Sandwiches” where guests can create their perfect burger, toss a fresh salad or grab a gourmet sandwich. The tastes of Southeast Asia, India, China and Japan come together for Thursday’s “Extended Asia” followed by Friday’s “Seafood Pattaya” where the crystal waters offer up fresh local prawns, crabs and lobsters served on ice or grilled. Saturday’s “Classics & Confectionaries” presents timeless favorites such as Greek salad, oven-baked whole salmon, green curry and bouillabaisse and margherita pizza. In addition, guests will be able to indulge in traditional Thai desserts with a modern twist. Every Sunday, the chefs pull out all the stops and offer the hotel’s famous “Sunday Brunch” that brings together a wide selection from around the globe. Bookings are absolutely essential for this very popular event. Monday to Thursday @ THB 420 net; Friday and Saturday @ THB 480 net, Sunday Brunch @ THB 1200 net; Wine Buffet @ THB 800 net. “Seven Days, Seven Themes” is available from Mondays to Saturdays from 12 p.m. to 2.30 p.m. and from 12 p.m. to 3.30 p.m. on Sundays. Edge restaurant is located on the 14th floor of the Hilton Hotel Pattaya. For bookings, please dial +66 (0)38 253 000. Friday & Saturday Churrasco Nights at Tavern by the Sea. The Tavern by the Sea Restaurant introduces the following daily promotions: Monday Curry Night features the tastiest curries, naan bread and salad buffet for just THB 449 net per person. Taco Tuesday offers as much as you can eat, beef, chicken and pork tacos plus chili con carne, Mexican beans, vegetables and salad bar for just THB 399 net. Wednesday is Ribs & Wings evening: finger licking good ribs and 6 different kinds of wings – all you can eat for THB 399 net per person (and with 1 glass of Heineken beer THB 449 net per person). 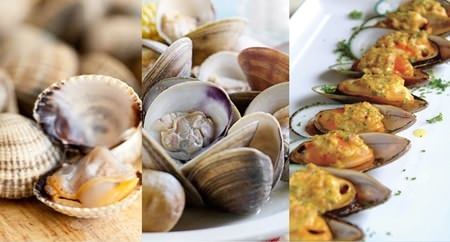 Thursday is Shellfish Night – as much as you can eat! Mussels, cockles, clams and shellfish, prepared 4 different ways and served with rice or fries. THB 499 net. Friday & Saturday Churrasco Nights offer prime meats and seafood, grilled to perfection on the fire and freshly skewered for you on the churrasco pens at the Tavern. All complemented by a full buffet of starters, side dishes and desserts. Only THB 690 net per person. Every buffet is open from 18.30 – 22.00 hrs. There is also a daily happy hour from 11 am – 6 pm. Watch all the premier live sports on one of the many widescreen TV’s or on the big projector screen (Sports hotline 038 418 419). Amari Orchid Pattaya, Beach Road, North Pattaya, Tel 038 418418, E-mail [email protected].com. Drift lounge and bar in the lobby at Hilton Hotel Pattaya is a cool, casual place to meet and relax, enjoy light meals, healthy juices, luscious cocktails and complimentary high speed wireless internet. Afternoon Tea (ideal for sharing) from 2:00 p.m. until 6:00 p.m. – THB 600 net per set, includes coffee or tea for two with a variety of sandwiches, savories, scones, pastries and sweets; Drifting Hour – Sunday to Wednesday from 6:30 p.m. until 8:00 p.m., Buy One Get One Free: Choose from a range of rum cocktails and long drinks; Cake ‘n’ Calories from 10:00 a.m. until 7:00 p.m., individual desserts, whole cakes, power bars, giant cookies and macaroons. For bookings, please dial 038 253 000 or email: pattaya.sales @hilton.com. Eat to the New Beat at Starz Diner located at the Hard Rock Hotel Pattaya between 2nd Road and Beach Road, Central Pattaya: A selection of Pan Asian and continental flavors, from the griddle, BBQ char-grill, pan, fryer, steamer, wok, and tandoori oven, as well as some really delicious desserts. Sat: THB 850++, Sun-Fri: THB 750++ food only. Sat: THB 1,080++, Sun-Fri: THB 980++ including free flow drinks. Children under 11 years of age eat for free. Show time for live music is from 6:30 p.m. – 10:00 p.m. For more information call 038 428 755-9 or go to http://pattaya.hardrockhotels .net. 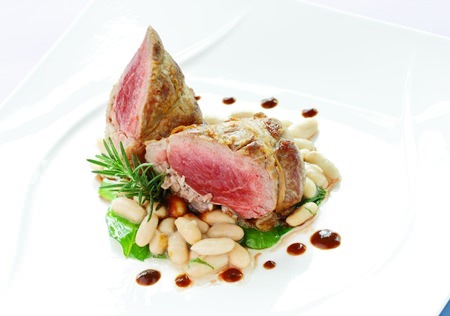 Acqua lamb fillet on canellini beans. Throughout the month of October, Chef Alberto Bruni at “Acqua” Italian restaurant will be presenting gourmet dishes incorporating sensational cured meats, pasta and lamb that will truly delight Italian food lovers. Prices start from THB 280++ (subject to 10% service charge and 7% VAT). Acqua Italian restaurant is located in the main lobby of Centara Grand Mirage Beach Resort Pattaya, and opens daily from 18.30-22.30 hrs. Call for reservations, at (038) 301 234 ext. 4266. The Peak offers modern Chinese cuisine complemented by a panoramic view of the bay. The Peak’s kitchen turns out a stellar selection of Chinese dishes including hot & cold appetizers sampler, steamed abalone stuffed with minced shrimps on sesame egg noodles, and eight treasure rice. Daily dim sum lunch is also available. The Peak Chinese Restaurant is located on the 8th floor of Dusit Thani Pattaya next to the Dolphin Roundabout in North Pattaya. Open daily from 11:30 a.m. to 2:30 p.m. and 6:30 p.m. to 10:00 p.m. For reservations and more information please call 038 425 611 to 7, ext. 2276. With a full salad and dessert buffet station, diners at Cascade can select their main course on the menu featuring Thai and western dishes such as fried seafood with garlic and hot basil leaf served with steamed jasmine rice; grilled chicken breast with barbecue sauce; breaded fish fillet, French fries and tartar sauce and many more. Price is THB 299++ per person (food only). The Cascade is located near the Main Lobby of Dusit Thani Pattaya. Open daily from 6 a.m. – 1 a.m. For reservations call 038 425 611-7 ext. 2153. Breeze Spa at the Amari Orchid Pattaya Resort has introduced a festive Halloween treatment that is available for the entire month of October. Breeze Spa’s ‘Abracadabra’ spa promotion includes a 30-minute Vitamin A purifying pumpkin scrub, followed by a 30-minute back massage and a 45-minute comfort zone facial, which includes a 15-minute foot ritual. The package includes a 30% ‘Abracadabra’ discount on the standard cost of a 2-hour treatment, and also the limited edition seasonal twist: purifying pumpkin scrub. For more information, visit www. breeze-spa.com. Hard Rock Hotel Pattaya’s Pink Sheets Program supports the fight against breast cancer with your help. Throughout October, 25% of all room revenue will be donated to the Breast Cancer Research Foundation (BCRF) and Thanyarak Foundation under the patronage of Her Royal Highness The Princess Mother. Room rates start from THB 3,824++ per room per night on Sunday to Thursday and from THB 4,079++ per room per night on Friday & Saturday. For more information, call 038 428 755-9 or go to website: www. hardrockhotels.net. Sugar Hut Resort & Restaurant, located only 5 mins from central Pattaya, is offering a special room package at only 7,999 Baht for 3 days 2 nights (2-persons). The package includes accommodation in a one bedroom suite villa with ABF and original Thai set menu for 2 persons (lunch or dinner). Relax at the large swimming pool with unique outdoor sauna and stream facilities or go jogging around the tropical garden. For more information and reservations, call 038 264 186 or 038 251 686, Email: [email protected] visit website: www.sugar-hut.com. Tiffany’s Show Lounge in North Pattaya will be hosting the final round of the annual Miss International Queen 2013 beauty pageant on Friday, Nov. 1 from 9.00 p.m. onwards. Tickets cost THB 1,800 for Mezzanine and THB 2,800 for VIP. For more information and ticket reservation, call 038 421 700-5. The Pattaya International Guitar Festival & Competition 2013 is taking place this year over two days, beginning on Friday 25th October at Central Festival Beach shopping mall and followed by a students’ competition and evening concert on Sunday 27th October at the Siam Bayshore Hotel. Organised by the Thailand Guitar Society, this annual event brings together many of the most well-known classical and contemporary musicians from all over the world. Admission price (Sunday Festival Pass) is THB 500 for adults, inclusive of coffee break and a soft drink between 15.00 and 18.00, or THB 400 for students. Children under 12 years get free entry. Proceeds from the event will be presented to the Father Ray Foundation. To book seats in advance, contact the Siam Bayshore Pattaya at 038 428 678. Mantra Restaurant & Bar will be hosting a tribute to The Beatles on Friday 18 & Saturday 19 October 2013 from 19:45 onwards. More than 40 of the most famous Beatles songs from ‘Love me do’ to ‘Let it be’ will be played during the evening by the superb tribute band Beatlemania. A set menu will be available at THB 2,600++ including performance or a la carte dinner with a supplementary cover charge of THB 650++ per person (free a souvenir T-shirt of The Beatles). Please book by sending an email to [email protected] mantra-pattaya.com or tel. 038 429 591. The next Pattaya City Expats Club (PCEC) meeting will be on Sunday, Oct. 20. Everyone is warmly welcome. The guest speaker will be Dr. Mukda Pattana-Anek from Bangkok Hospital Pattaya (BHP). Her topic will be “Hearing Loss in the Elderly” and latest hearing aid technology – “Dream.” The Club meets every Sunday morning at the Tavern by the Sea restaurant located on the north end of Beach Road (part of the Amari Orchid Resort). The program starts as usual at 10:30 a.m. with a buffet breakfast available from 9 to 11 a.m. The Pattaya International Ladies Club (PILC) organizes regular lunches and coffee mornings on the first and third Tuesday of every month. There is also a newcomer’s coffee meeting at Casa Pascal on Second Road on the last Monday of every month. No reservation necessary and the coffee begins at 10:30. For more information email infopilc @gmail.com, or go to the website at www.pilc-pattaya.com. The Rotary Club Eastern Seaboard (RCES) meets 6 p.m. every Thursday at the Siam Bayshore Resort, between Beach Road and Second Road in South Pattaya.. The meetings on 1st and 3rd Thursday in each month will include guest speakers and on the 2nd and 4th Thursday there will be a presentation on club activities. Meetings are always followed by an informal a la carte dinner in the main dining room. Everybody is welcome to join us as guests; please check the website for important dates and information www.rotary-es.org/ or contact the Rotary Secretary at [email protected] rotary-es.org. Rotary Club of Jomtien-Pattaya welcomes you to their Wednesday meetings in the Rotary room, Royal Cliff Grand Hotel: Time 18.30 for 19.00. Contact Brendan Kelly (Secretary) 084 033 6296. The Rotary Club Pattaya Marina meets every Friday at 7.00 p.m. at the Pullman Pattaya Hotel G, Wongamat Beach, between Soi 16 and 18 in Naklua. The evening meetings include a sumptuous international buffet. For more information contact Club President Gerard Percon at [email protected] pattayamarina.com. The RLC (Rayong Ladies Circle), which operates mainly in the Ban Chang and Rayong areas, is a friendly and social group of international women. They hold a monthly coffee morning, amongst many other activities, on each second Tuesday of every month in the home of one of their members. Everyone most welcome to join! For more information, send an email to [email protected] or visit the website at www.rayongladiescircle.com. RC Phönix Pattaya (Deutsch), meets every Tuesday from 17.45 onwards at the Holiday Inn Hotel, Pattaya Beach Road Soi 1. Contact President Dr. Otmar Deter, Tel. : 081-898324125, Email: [email protected]rotary-phoenix-pattaya.org. or for more info go to: www.rotary-phoenix-pattaya.org.